To all of you who have come out, today we celebrate YOU! We celebrate your life, your voice, and most importantly your story! How you choose to share that story is all up to you. Today, I wanted to share with you how I came out back in 2012. I was in my first college art class, ART 1011 2-D Design. Around that time I was at a breaking point with my self-confidence and self-identity. So, I decided to use my final art project as an opportunity to not only come out to my friends and family, but to also come out to myself. For 19 years I kept a journal. I began writing in elementary school and continued to do so until my second year of college. I would write almost every day. I decided to use journal entries that specifically pertained to my closeted sexuality, my insecurities, my anxiety, and my self-doubt. I wanted to channel all of the hurt and uncover all of the lies that I had tried to convince myself of, and put them all into one tangible piece. Among the journal entries I included doodles about high school friendships, relationships and break-ups, and poetry about being bullied for being “soft” and “too sensitive”.– All of the things that kept me digging a deeper hole into the closet I so desperately tried to escape. After dramatically applying my journal entries via Mod Podge, I then drew and cut-out silhouettes of fictional characters that I related to in a variety of different ways. Characters that helped me realize my true values and self-worth. I then applied folded paper blindfolds over the character’s eyes. On the inside of the folds, I wrote words that were given to me by other people that I let attach themselves to me. Words such as weak, unworthy, incapable, gentle-giant, over-sensitive, etc. On the outside of the folds, I wrote words that I assigned myself. Words that gave me confidence and power; strong, worthy, capable, empath, human. 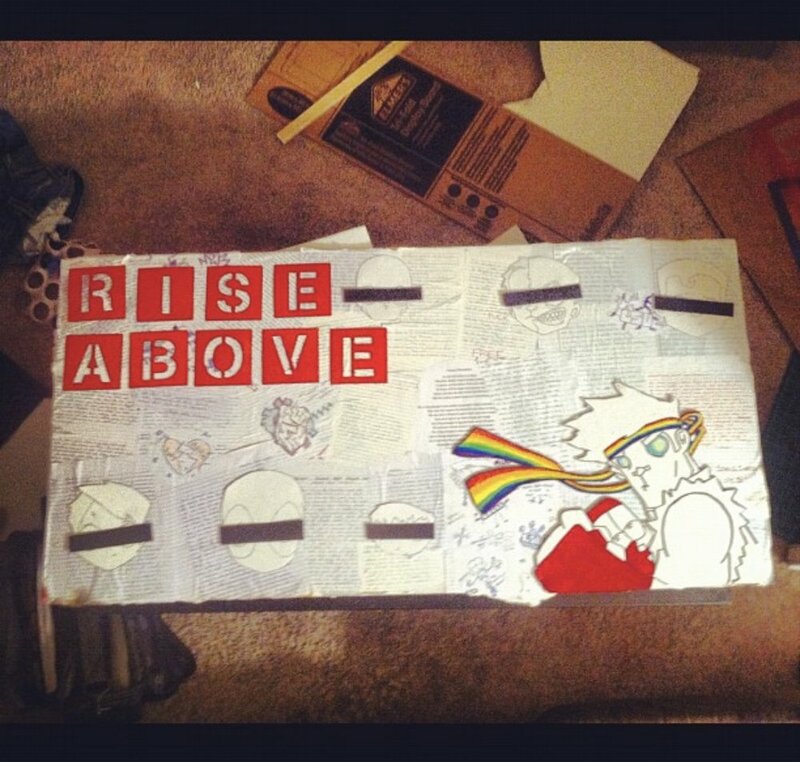 To complete the piece, I placed a fighter at the bottom right and stencils reading “Rise Above” at the top left of the board. It was finally all coming together. Art has allowed me to transform into my true, authentic self. Just as it has done for me, Art will always be there for you. The final outcome of this piece reminded me that Art will always be there to show you who you really are. Did you or someone you know use art a way of coming out? If so, I would LOVE to see it! Share images and your story with me by emailing me at charlie@leurmagazine.com.